So lately I have been pretty down in the dumps about my Migraines, I am coming off a torture some week and it is hard to stay positive. I mean I wake up most days with some sort of headache and last week it was a daily migraine but life does not stop because I feel awful, so the constant pain and me just trying to get thru the day bums me out. So I am pretty much a Debbie Downer lately and no one likes that but everyone is entitled a little time to feel sorry for themselves? NO? Well I had it and yesterday I decided to take my doc up on her offer to be referred to a neurologist so I called my docs office and I am STILL waiting on a call back. I know doctors are very busy but my doctor is so busy I feel as though when I am talking she does not listen but instead is pre-thinking about what to tell me so she can move on. Whatever, hopefully this neurologist will be different and I am scared he or she will say you have Migraines deal with it… so pray that there will be some new options to try like maybe a lobotomy? HA! Moving on…. Tonight is OKC Thunder Girl finals and I am going because I A. want to support my friends and B. I like to watch the dancing! It is still bittersweet for me knowing I could be up there but all good things must come to an end, no one wants to be the oldest on the team and heck say I tried out I could very well be 11 YEARS older than some of the girls, talk about depressing!!! Tonight my good friend Chelsea is going with me, she just got back from Italy on her honeymoon and I am so excited to hear about everything. 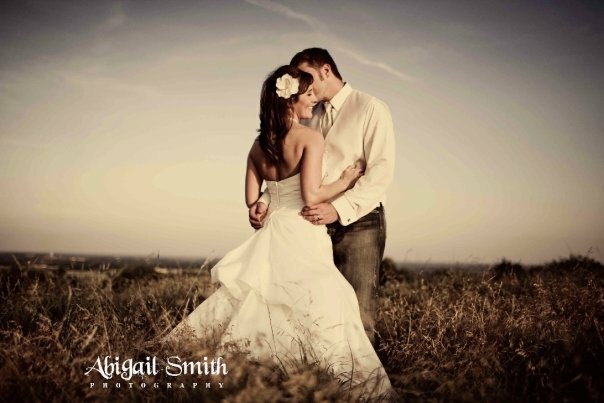 Below is one of her wedding pics and they are TO DIE FOR!!! So to check out some more you can go to Chelsea’s blog on my blog list it is the Coty & Chelsea one! So speaking of being in the trenches this morning started off bad……… I was driving to work and low and behold were two dogs a German Shepard and a yellow lab were running across 134th Street by Penn (busy road if ya don’t know) and both had tags on. SO seeing that I am on a mission to save animals I was thinking if these were my dogs I would pray someone would stop, check their tags and call me so… I hop the curb and pull into the field, impressive huh? I get out of the car and yell for them, walking thru the thick brush and I can tell they must of just gotten out because they were hyper and playing like fools….. so I call them and walk towards them and they just kept running the other way so I don’t know what to do but I am also late for work, people are looking at me like a crazy person and I am only 1 girl what will I do with two huge dogs… so with a broken heart I left. I mean really, what to do in that situation? If I had on running shoes I would go after but I didn’t! It makes me super sad, I don’t know why God shows me these animals if I can’t help!!!??? Shannon has talked about her patients coming in for a shot when they have a migraine…have you heard about those? I might even check into them for myself! !